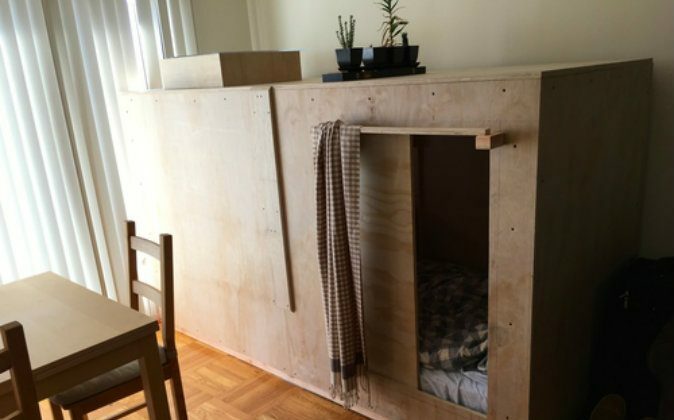 The San Francisco man who lived in a plywood box in his friend’s living room has violated local housing laws, forcing him to leave his friend’s apartment, according to city officials. City officials pressured Peter Berkowitz, 25, to take down his pod and move out of his friend’s place. The pod, which was built initially because it was a “solution” that worked for him, took Berkowitz nearly three weeks to complete. The median rent for a one-bedroom apartment in San Francisco is $3,460 a month. The pod cost Berkowitz $1300 in total, “$550 excluding upfront capital costs,” he wrote on his blog post. However, Berkowitz’s solution, it turns out, was illegal—and very dangerous, according to city inspectors. “The housing codes, the fire codes and the building codes are fairly restrictive in terms of what you can do inside, in terms of coming up with another enclosed bedroom,” said William Strawn, director of public affairs for San Francisco’s department of building inspection. “With these types of, what I’ll call creative efforts to try and cope with what everybody recognizes is a tough housing market here, you still have to follow some basic safety … rules, ” Strawn said. I’m 100% concerned with doing this legally. It is not set up anymore. According to the Washington Post, even if bedroom pods are built because the rent in the city is extremely high, the act is still illegal. The median rent for a one-bedroom apartment in San Francisco is $3,460 a month, according to Zumper, a real estate marketplace.